A modern visitor to the vibrant Alpine Republic of Austria can be forgiven for succumbing to its charm, beauty, and permanent sense of order. From the stunning Alps in the west to the cobblestoned streets of the Imperial City of Vienna in the east, it’s a majestic country which boasts great pride from its 8.5 million inhabitants. It’s delightful in spirit, neutral in foreign affairs, and has one of the most stable political systems in all of Europe. But if one is to receive their news from the Anglo-American establishment, it would seem that Austria is just one step away from its horrid past of the 1930s and 40s. That’s the image projected by outlets such as the New York Times, The London Telegraph, and the BBC, who foreshadow marches of men with armbands and rounding up of undesired residents. It’s a shameful trope practiced by dozens of journalists and outside commentators who write about Austria. A tiresome and facile posture which makes the domestic population both ambivalent to outside opinion, and spiteful in the same fell swoop. These facile arguments make a caricature of the people of Austria, slandered as being just two elections away from totalitarianism. 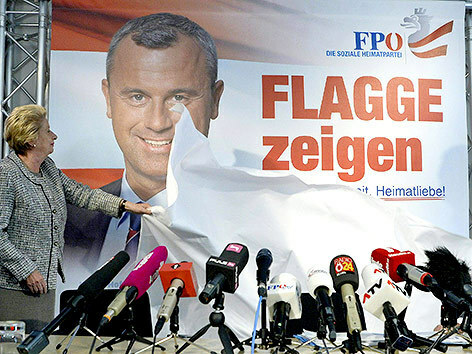 In the wake of the first round win of Freedom Party Presidential Candidate Norbert Hofer in April and the subsequent resignation of Chancellor Werner Faymann on May 9, the Social Democratic Party leader in power since 2008, the high-browed opinion of the establishment in London, New York, and Washington has been predictable. The second round election will take place on May 22nd, and it hasn’t stopped the slander from abroad. During the Vienna city elections in September 2015, a British journalist parachuted into town and scribbled together what was tantamount to a mass smearing of the entire Viennese population in the New York Times. She wrote that behind the beautiful churches and tourist-friendly cafes of Vienna “lurks the legacy of the Nazis who forced Jews to clean sidewalks with toothbrushes.” And that was only the second sentence of a 1,000-word article. To point to the obvious, Austria is far from a televised reunion of a Nazi comeback. Indeed, the country of Austria in the year 2016 is worlds away from its existence in the 1930s. Its most prized celebrity du jour is Conchita Wurst, a bearded drag queen. Tel Aviv Beach, a bar on the banks of the Danube River, is one of the most popular spots in town for young people. Left-wing protestors who demand free education, marijuana legalization, or support of migrants dwarf any right-wing public demonstration. Presidential hopeful Norbert Hofer’s platform represents approximately 90 percent of the same agenda as the rest of the main political parties in Austria: skeptical of foreign treaties, protection of social welfare and state services, some mild curbing of the debt. Rhetoric about immigration is hot and plenty, but the same is seen by members of the two leading political parties. Is this in anyway comparable to the very real tyranny which already controls state institutions not far from Vienna’s gates? That people would be concerned should not surprise anyone, least not the Anglo-American establishment, who themselves don’t have a great record when it comes to accepting refugees in times of peril. And weighing the small numbers of refugees considered for the United States and Britain and the overblown outrage that ensued, the Austrian response is as mild as vanilla. That being said, any parallel of the 1930s to today is ludicrous. After the bloodshed of years past and the subsequent decades of peace and progress, Austria has risen to become a great country with industry, capital, and stability. It is a great place to invest, a crossroads of Europe, and its capital of Vienna has been voted the “most livable city in the world” seven times in a row. For the elementary commentators still stuck in their World War Two textbooks, such an Austria is not conceivable. But it grows nonetheless. While there may be some disagreement on the gravity of proposed policies by opposing political forces in Austria and abroad, the temptation to resort to an immediate invocation of the past must be eliminated. Both abroad and at home. The people of Austria deserve better and should at last be free to engage in the same political reality as every other modern, democratic country.